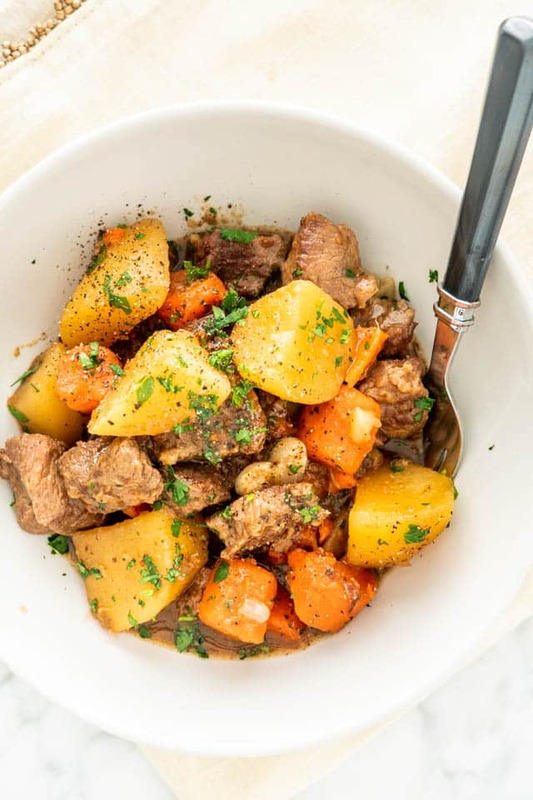 This hearty and comforting Irish Lamb Stew is incredibly easy to make, made with carrots, potatoes and lamb! It’s wholesome, earthy, totally delicious and perfect for a chilly winter night! I remember a time when I was not a fan of lamb. What was I thinking! Well, I’ve changed! I can honestly say I love lamb now and look forward to making it often. And I do! Such as this lamb stew! It’s incredibly flavorful and if you’re not a fan of lamb because of the smell, I have to tell you not to worry, you won’t smell a thing, except deliciousness. This lamb stew is about as simple to make as stews can get! I mean it! A handful of ingredients, minimal prep time and all you have to do is wait for the stew to cook. So why Irish lamb stew? Over Christmas we had a couple friends stay with us from Ireland. When friends come to visit they always ask me what to bring me and my answer is always a cookbook from where they live. So they brought me an Irish cookbook. With St. Patrick’s day just around the corner, I’ve been wondering what to make for you guys that’s Irish. And this is how this lamb stew came to be, by flipping through the book, this is what jumped at me. 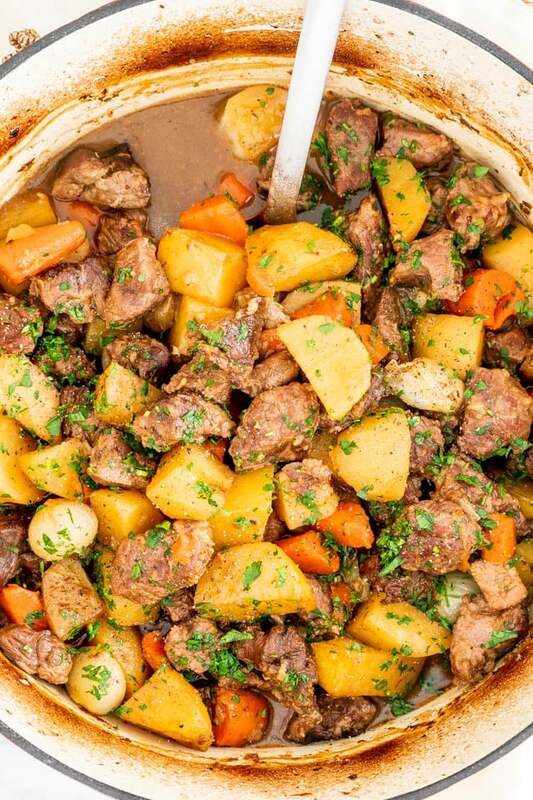 There really is no such thing as an exact Irish stew recipe because every family has their own version. However, there are some basic ingredients that are always added to stew, so this is what I wanted to share with you today. 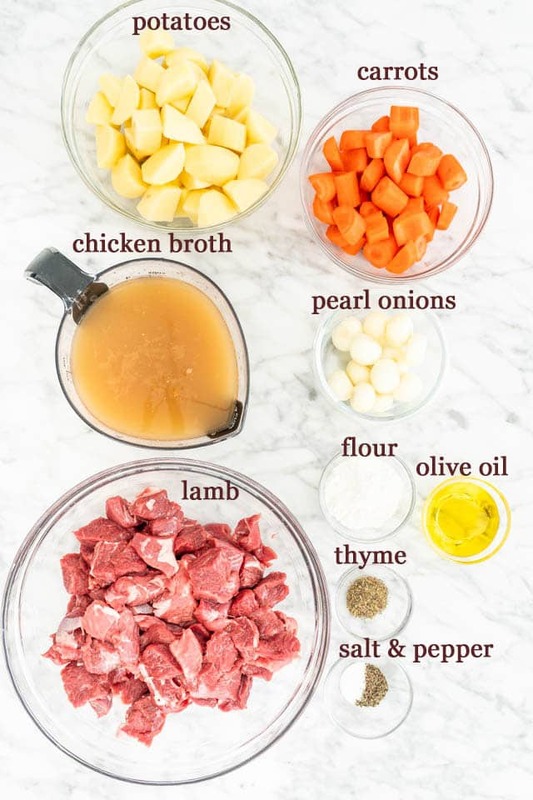 A stew recipe that anyone can make and expand on this recipe as you like. The sky is the limit, really. Just add whatever you like. Feel free to try different herbs and spices! First, toss the lamb meat with some flour, making sure each piece of meat is coated in flour. Ever wonder why? While there are conflicting feelings on this subject, the answer is simple. For one, we are essentially making a roux. The flour on the meat mixes with the fat in the pan as it cooks, providing thickening power when liquid is added. Aside from its thickening power, flouring the meat provides a flavorful crust that insulates the meat from the high heat. Heat the oil in a Dutch oven then toss in the meat and brown it on all sides, until nice and brown. You might have to do this in a couple batches. Remove the meat from the pot and set aside. Add the carrots, onions, potatoes, herbs and spices to the Dutch oven. Add a splash of the broth and scrape the brown bits from the bottom of the pan. Cook for a couple minutes, then add the meat back to the pot and the remaining broth. Bring to a boil then season again with salt and pepper if needed. Cover the pot and bake in a 350 F degrees preheated oven for 1 1/2 hours to 2 hours, until the meat is very tender. For stews there really is no rule when it comes to which potatoes to use, because stews have less liquid than soups. Any potatoes will work, including russet potatoes, Yukon Gold potatoes, which is what I used here. Fingerling potatoes or baby potatoes would also work quite well in stews. I prefer using shoulder, leg or shank for stewing. The lamb’s shoulder is full of flavor, and because it takes a while to become tender, it’s a great choice for stewing or slow roasting. Shank is a cheaper cut, taken from the lower part of the back legs. There is a lot of collagen in the shank, and when cooked slowly the meat gets a soft melting texture, which is perfect for stews. I usually prefer leg because I find it at Costco and it’s usually boneless and comes at a great deal. The leg, like the shoulder has a lot of flavor. Leg of lamb is great roasted whole, but I also love it in stews, because it doesn’t take so long to cook. In this stew, the meat was done in 1 1/2 hours and the meat was super tender. 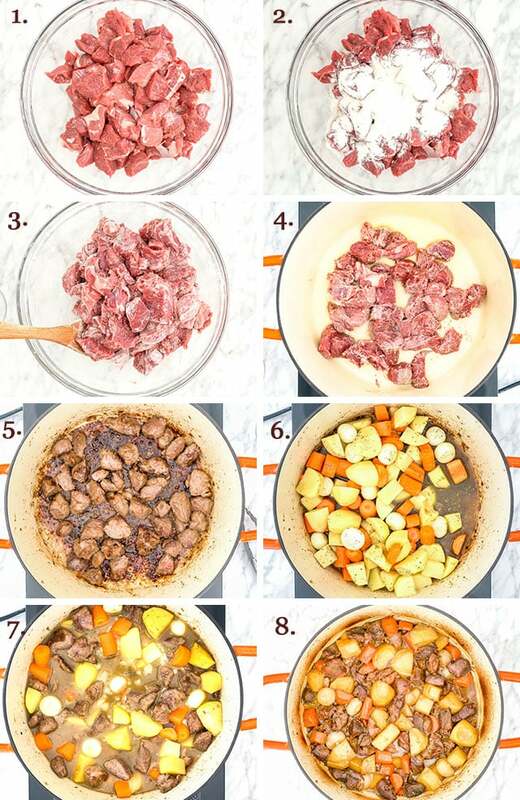 Always brown your meat first to lock in that flavor and provide that thickening power to your stew. Use the right cut of lamb for the most flavorful lamb. Don’t be afraid to experiment with different spices and herbs. 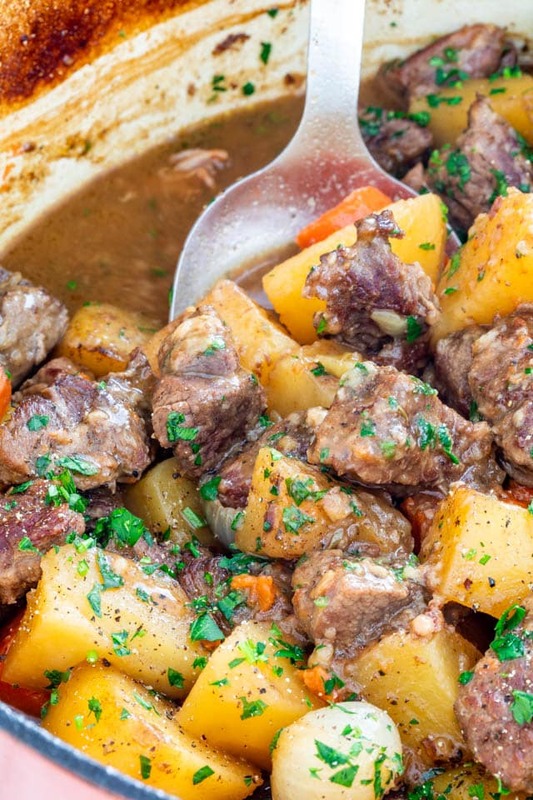 Serve this lamb stew with a good crusty bread that is great for dipping. Allow the stew to come to room temperature but don’t leave it out, unrefrigerated for more than two hours. Store it in airtight containers in the refrigerator for 3 to 4 days. You can freeze this stew for up to 6 months. Simply transfer it to airtight containers or resealable freezer bags and pop them in the freezer. 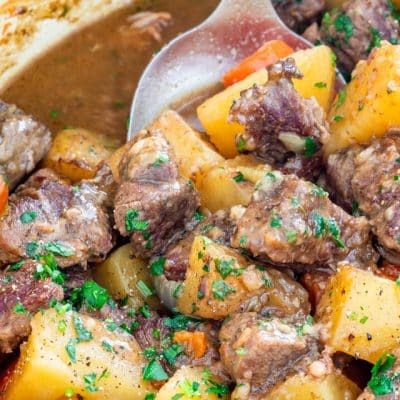 This hearty and comforting Irish Lamb Stew is incredibly easy to make, made with carrots, potatoes and lamb! It's wholesome, earthy, totally delicious and perfect for a chilly winter night! Toss the meat with flour: Toss the lamb cubes with the flour well, ensuring each piece is coated in flour. Brown meat: Heat the oil in a large Dutch oven. Toss in the meat and brown it on all sides, until nice and brown. You might have to do this in a couple batches. Remove the meat from the pot and set aside. Add veggies and combine everything together: Add the carrots, onions, potatoes, herbs and spices to the Dutch oven. Add a splash of the broth and scrape the brown bits from the bottom of the pan. Cook for a couple minutes, then add the meat back to the pot and the remaining broth. Bring to a boil then season again with salt and pepper if needed. Bake: Cover the pot and transfer to the oven to bake for 1 1/2 hours to 2 hours, until the meat is very tender. Garnish and serve: Garnish with fresh parsley and serve. So very tasty and easy to make. Taste fantastic the next day too. Thanks for sharing.